Two princess cut diamonds set in 18k yellow gold with a platinum. This engagement ring is set with light and dark champagne princess cut diamonds. 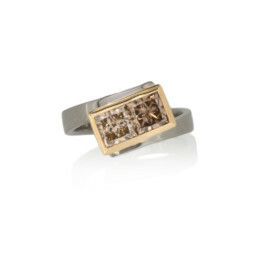 They are set in an 18k yellow gold rectangular setting and sit on a platinum band. A future wedding band is to be made in yellow gold to snugly fit against this ring. The diamonds are Origin Australia© and responsibly sourced from the Argyle mine.